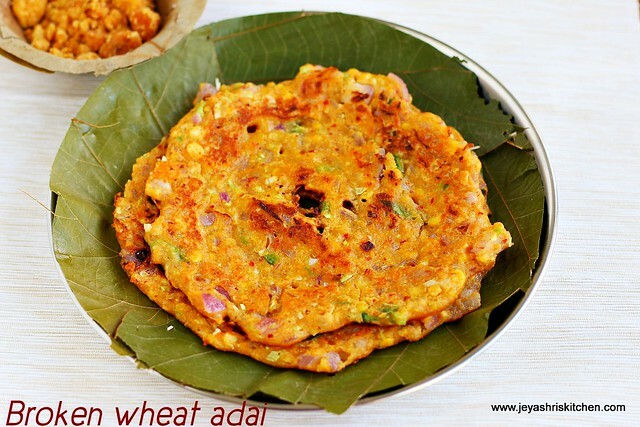 Samba wheat | dalia | samba godhumai rava adai is a healthy breakfast recipe. We generally make adai with rice and dal but i have tried with samba rava . The adai can be even more healthy by adding some veggies to this. No one in the family can make out that it is made with broken wheat. The adai tasted similar to the normal rice adai only. You can have this adai with jaggery or just can have as it is or can be served with coconut chutney. Soak the broken wheat and the dals separately for 2 hours. You can soak it together if you want. After 2 hours grind the broken wheat into a fine paste. Grind the red chilies along with this. Grind the dals into a coarse mixture. Add asafoetida along with the dals. Let the dals be slightly coarse and not too fine. Transfer both the ground paste into a bowl and add curry leaves, salt and finely chopped onions, grated carrots, finely chopped cabbage and capsicum. Pour a ladle full of batter on a hot tawa and make a circle. Drizzle with oil on all sides. Adding veggies is truly optional. You can add finely chopped coriander leaves too. You can grated beetroot too. Thanks for sharing such a healthy recipe. will definitely try this. Can we use both coarse and fine varieties of dalia?